On Monday, Tesla Motors unveiled a preproduction prototype of the 2014 Tesla Model X, at the North American International Auto Show (NAIAS) in Detroit. The Model X is an all electric luxury SUV designed by Tesla Motors, built on the same underlying chassis as the Tesla Model S, and is expected to go into production some time in 2014. 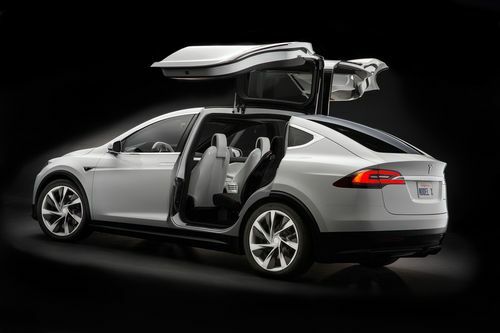 The most unusual feature of the Tesla Model X, the so-called "Falcon Wing" doors, will be retained. Essentially these are "gull wing" doors, in that the doors end up positioned above the roofline, but Tesla's implementation is different enough to warrant a new name. Hence, Falcon Wing. The difference between the typical gull wing doors, and Tesla's falcon wing doors, is that in Tesla's implementation the door is double hinged and opens upward rather than swinging outward. This means the Model X doors can be opened in a tight parking space without banging into the neighboring cars. The exterior looks like a taller Tesla Model S. Unlike SUV's with flat rooflines, the Model X rear roofline slopes downward, and includes a large hatchback to provide entry into the rear cargo area. The tail has a sharp crease that one thinks might be for aerodynamics. The door handles, like on the Model S, are flush with the car surface, to improve aerodynamics. The Model X interior features three rows of seats, and will seat either 7 or 8 people in total. The middle row of seats are on posts that in turn go into channels in the floor. This leaves a lot of space underneath the seats for storage, in an implementation that is unlike any other car. The rear trunk area will have a sliding shelf that fits on a pair of guide rails. The central area of the front console will, like the Model S, have a 17" LCD touch screen display. It is is still planned to offer the Model X with different drive train choices, including an all-wheel-drive version with dual electric motors. One to power the front wheels, the other to power the rear. Unlike the Model S, the X will have only 60 kilowatt-hour and 85 kilowatt-hour battery packs. According to the British website, AutoCar, Tesla is still mulling whether to introduce the Model X for Europe. SUV's are not as popular in Europe as they are in the US. Even if it does make it to Europe, a right-hand-drive version for the UK might not be ready until 2015. A year ago when the Model X was first announced, Tesla expected to enter limited production of the Model X in 2013 with full production commencing in 2014. The reports circulating now say production won't commence until 2014. It may be that the production delays of the Model S affected the schedule for the Model X.